The Horror Movie BBQ: Take Me Out To The...Maxx?!?!?! Rochester, NY became Bayside this evening thanks to the local minor league baseball team The Red Wings. Why? 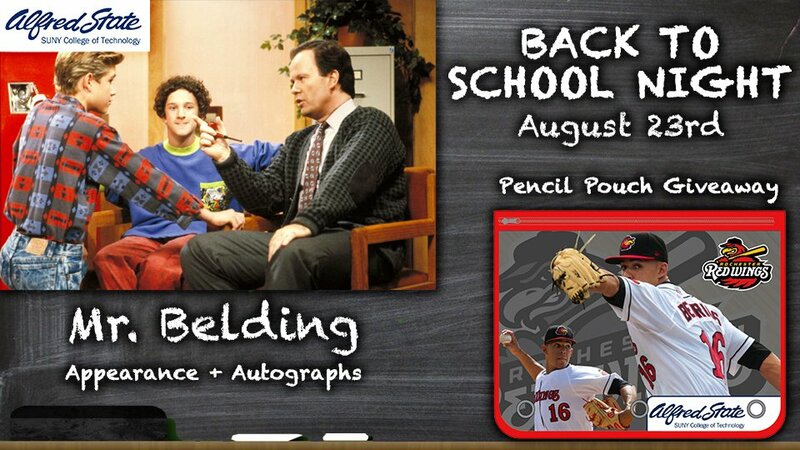 Well, they were rolling out the red carpet for a star of one of my all time favorite tv shows, Saved By The Bell. Screech? Nah, Red Wings are above that silliness. No, sir. 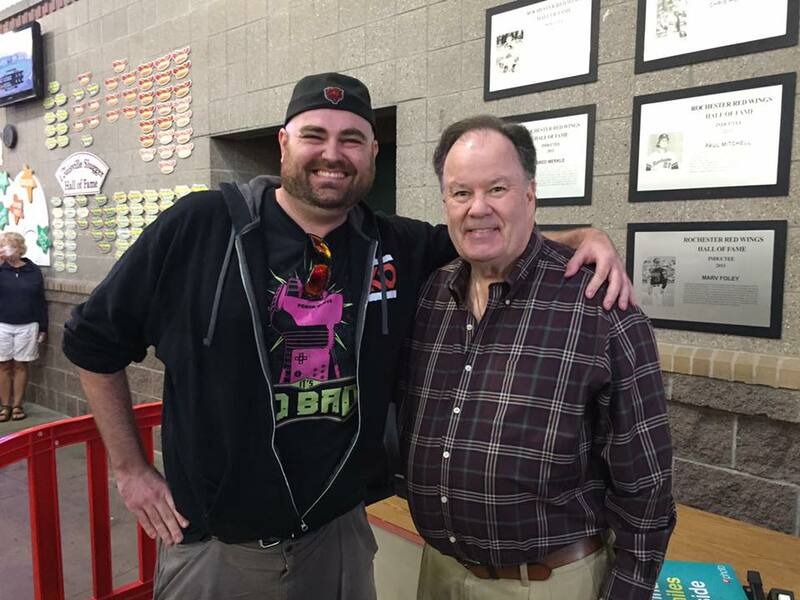 Mr. Belding himself, Dennis Haskins was invited to ring in the new school year with "Back To School Night"! Sure, I wasn't expecting Max to sit around pulling his thumb off and pulling a burger out a hat or see Zack Attack making a music video, but I was expecting a good time. Thankfully, I left my neon pink tank top and neon shorts at home. No one needed to see that. I leave that to the more popular Bayside allstar. 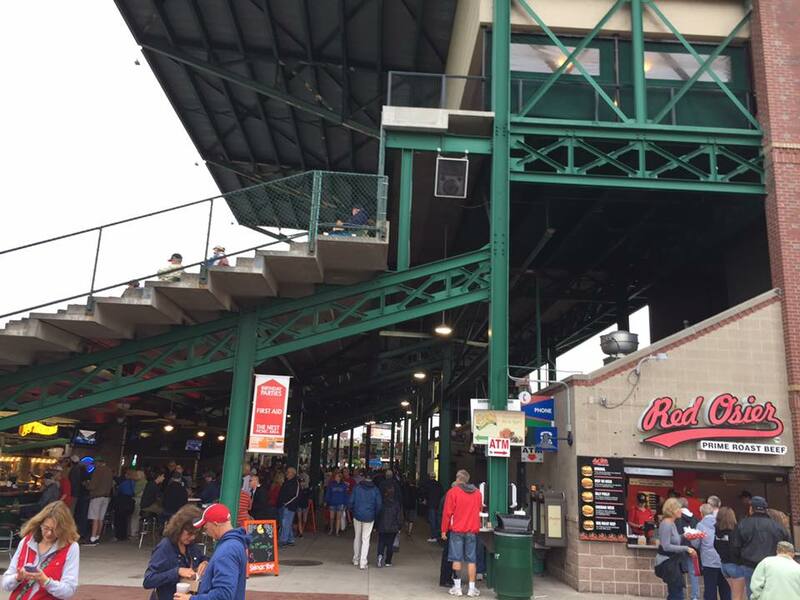 Happy dance aside, it was time to hit the bricks and head out to the ballgame! Got the stadium a little before 5 pm. Dennis was to start signing at 6 and I knew I had to be the first in line. 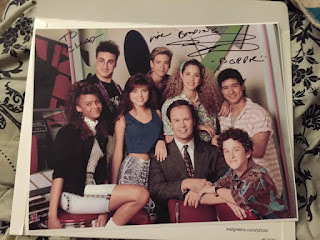 I'm no nerd like Screech or Ollie, but I pride myself on being the number 1 SBTB fan, so it was non negotiable. Call it a Zack-sized ego, but it had to happen. And happen, it did. Within almost 30 seconds of me getting my spot , a few more people showed up. Then...more than a few. 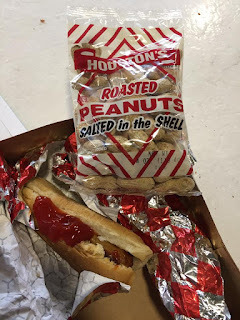 I was also getting hungry and it was $1 Hot Dog Day, so the temptation of delicious stadium dogs was in the air. But, I knew if I dared move from my 12 inch of concrete, someone would take my spot quicker than Lisa could take her dad's credit card. Mr. B was late. 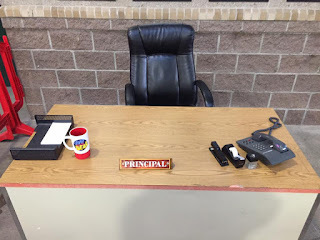 By 6:10, our favorite bodacious principal was late. Oh the irony. He's busted Zack multiple times over the years for these shenanigans. Maybe he was calling the Teen Line or getting wrestling lessons from Slater. I mean, what other excuses could he have? How could such a great figurehead of authority be so tardy? 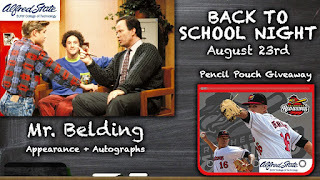 While Belding has displayed his fun loving side over the years, he'd never let his fans down. 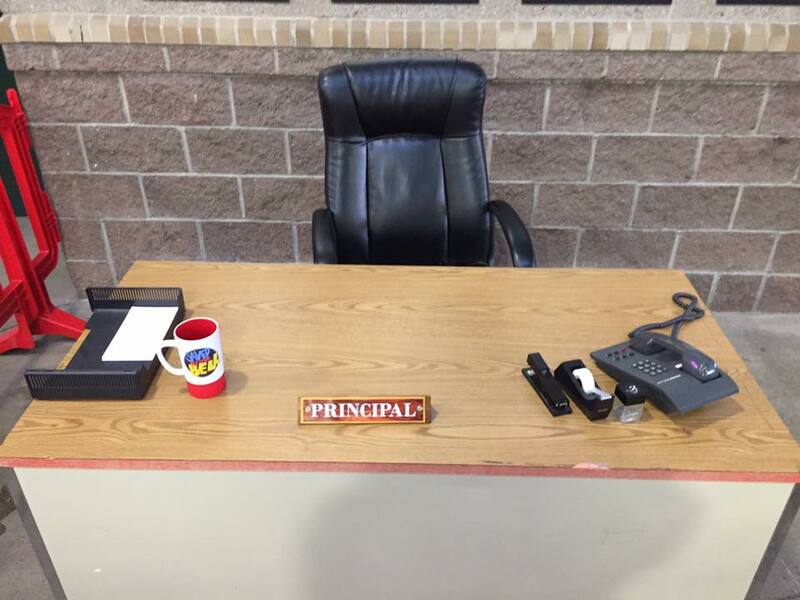 Besides, The Red Wings wouldn't have gone to the trouble of getting his desk all the way from Bayside High to Rochester if he was gonna be late. 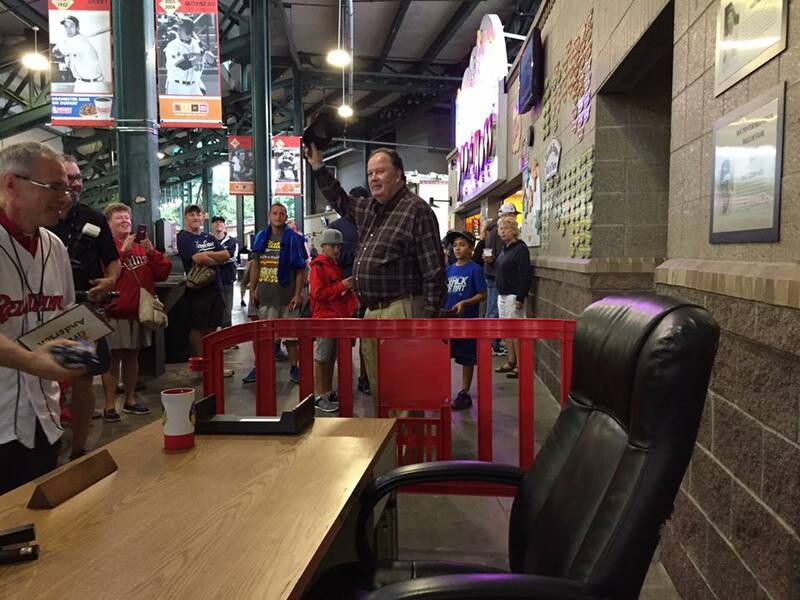 After most likely writing up expulsion reports for his students, he finally came out to greet his fans. He was given a very well deserved applause and cheers. No matter the reason why he was delayed, we were all pretty darn excited to meet him. He even gave us a "HEY HEY HEY WHAT'S GOING ON HERE!!!". What else could you ask for? Being first in line also lead me to hear his frustration with hearing that 8x10 photos were being sold, not given away. On top of that, Haskins also instituted a photo op for everyone rule. Normally, due to time restraints, these appearances are relegated to autographs only. A very common rule set in place to make sure everyone gets time with the guest. I understand and totally respect that rule, but when Dennis started pushing his makeshift desk up against the wall and telling staff to take photos with every fan, I was blown away. Dennis does conventions quite often so he understands how crazy lines can get, so I was super appreciative for him to bend the rules. He greeted me with a handshake, asked my name and proceeded to sign my item, a 11x14 poster i had printed up at Walgreens. Hopefully, I'll be able to get some more cast signatures on this! It was my absolute pleasure and thrill to meet someone who I have spent most of my life enjoying and loving. I simply can't tell you how happy of an experience this was. Dennis was a class act all the way and lived up to my hopes. Saved By The Bell has always been a show I've had a deep love for, even when it wasn't the cool thing to watch. Many Saturday mornings were spent laughing and making gaga eyes at Kelly Kapowski (which has never truly gone away). To this day, I watch it and continue to have a fond love for it. I think it's just one of those shows I'll always watch and never get tired of. 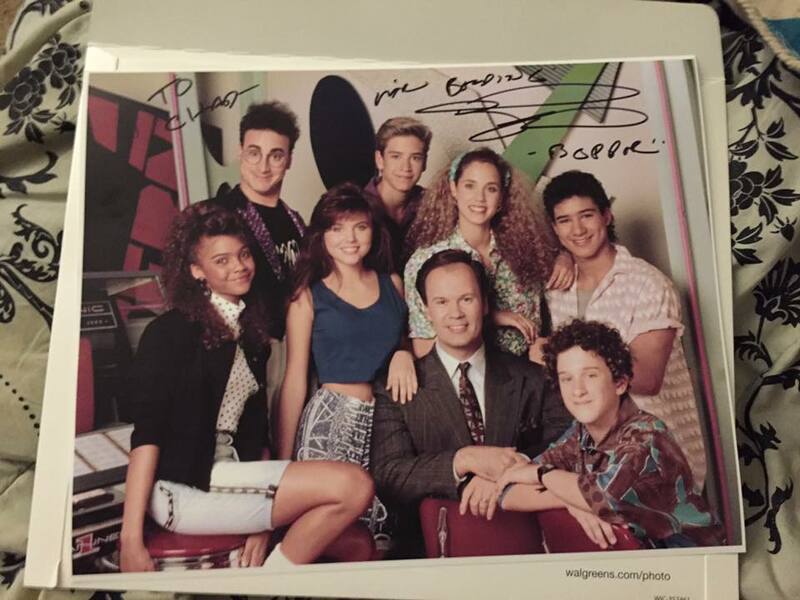 Some people have Golden Girls or Game of Thrones, I've got SBTB. I really wanted to stick around root for the home-team, but it rained and the game was on a delay and I had rabbits to feed. That and I wanted to watch that SBTB episode with Johnny Dakota! Oh and I got my dogs and some peanuts! Not bad for just $3! I'd say this capped off an already perfect trip to the ballgame, preppy!